We had three very good candidates this year. Several renominated from last year. All were worthy candidates but Dr Shi was a stand out due to his contribution to teaching in China. Once again we thank Hill's Pet Nutrition for their ongoing partnership with FASAVA in support of our organisation and the sponsorship of this award. The FASAVA General Assembly will be held in Australia at FASAVA Congress 10th August 2017 on the Gold Coast. We hope to see you all there. Executive Board meeting on August 9th 2017. Date and Time to be Confirmed. Dr Simon Yang unfortunately has resigned from the Executive committee due to work load at home and is political aspirations to become Major of Taipei City. We wish him luck and hope that he remains In contact with the many friends he has made in FASAVA. 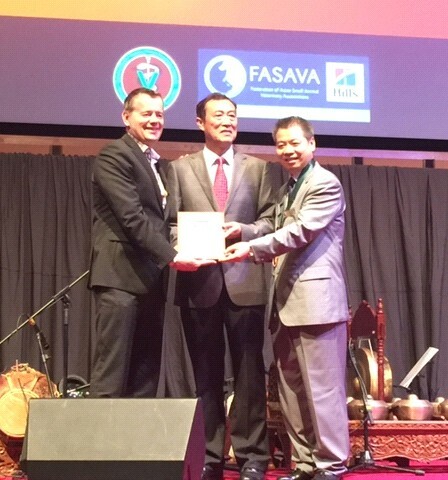 We welcome Dr David Tan, current President of the Taiwan Veterinary medical Association as new member of the FASAVA executive to replace Dr Simon Yang. Our constitution continues to be a dynamic document. At this years general assembly we will be suggesting that we make a few changes to the current constitution so that we can increase the Executive to 7 members to give us more wide spread coverage of the Asian Pacific region. Although any changes to the constitution need to be ratified by the following executive meeting, expressions are interest will be called for at the meeting. So if you are interested in representing your country in future FASAVA meetings, please put your name forward. ©2019 FASAVA. All rights reserved.